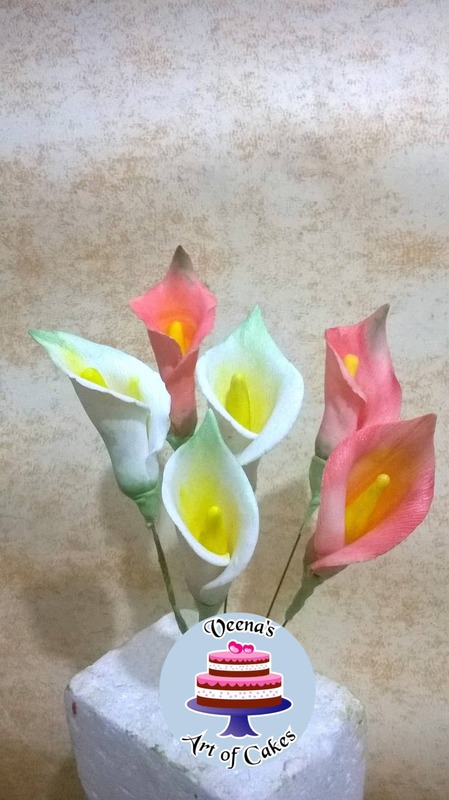 Today for my Tip Thursday on Facebook I shared a collage of how to make these Calla Lilies. I do hope that I will be able to make a video and show you how I dusted these as well. But that will have to be for another day. For now I have a little pictorial on how I made these. Gum paste, cornstarch, veg shortening. Ball tool + Foam pad to thin the petals. Cut a 20 g wire into three. Make a U hook at the end of the wire by twisting it once towards you then again towards the wire. 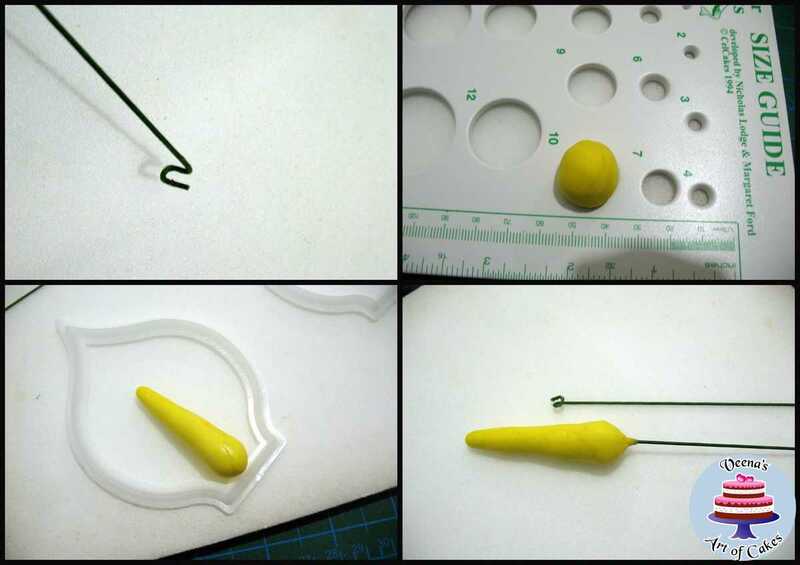 ( weather you make a U hook or a plain hook won’t matter much, because the flower is not really heavy but do make a hook so the paste has something to hold on to. Roll the gum paste into a smooth ball. The center needs to be about 3/4 length of the petal so the size of the ball will vary depending on the size of the petal. here I have about a size ten on the size guide. Roll into a sausage then tapper towards one end as shown. Insert the wire and pinch the base to ensure the wire is secured. Optional – Apply a light coat of glue to the entire center and dust with yellow non-perils or yellow petal dust or yellow colored polenta . Note: I personally do not coat my centers in any of the above. I later dry dust them with petal dust because I do not like the non perils or polenta or excess dust falling over the cake and such so.. I just leave it. Let the center dry completely over night before you proceed with the petals. 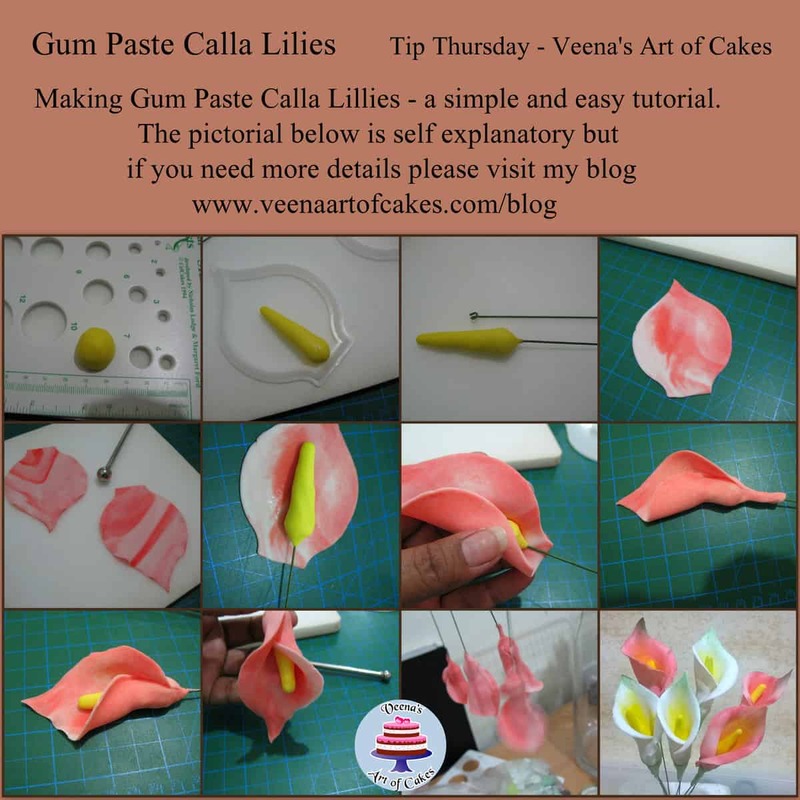 For the petals you can use the color of gum paste that suits your project. Most people make it in white. Here I have marbled some rose pink and white. Roll your paste not too thin. Calla lilies are a fleshy flower so not very thin. Cut the petal our with your petal cutter. If you do not have a Calla petal cutter – you can use a Heart shaped cutter as well. Vein the petal with a Calla petal vainer or all purpose vainer works too. Thin the edges with the ball tool but do not frill the edges. 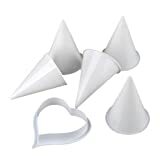 Usually you would make a cone of the petal – attach the two edges and let dry over a cone former, but with that I have to find all the cones.. So, I do it differently. Add some glue to the center of the petal. place the dried center on the petal. 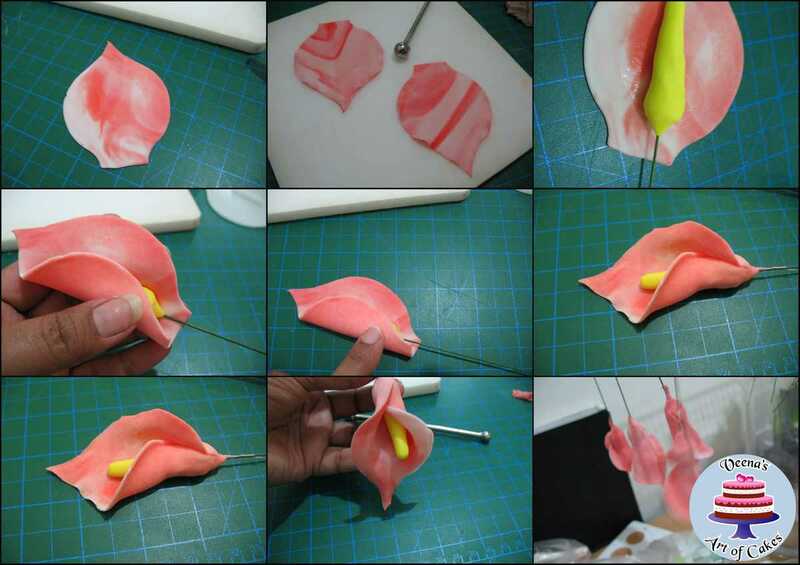 Next gently fold the left side of the petal over the center – secure with more glue if necessary. Then fold the right side of the petal over left as shown below. Pinch the bottom neatly so you have a nice neat seam. Gently curl the edges to give it a nice open flower shape as shown below. Let dry on a drying rack. Now I did not take pictures of the dusting of these flowers. bu I will update this post later. may be with a few more pictures or a video. To dust the petals – I dust the center of the petal as well as the yellow center with more yellow petal dust. and the top tips of the petal with some green. 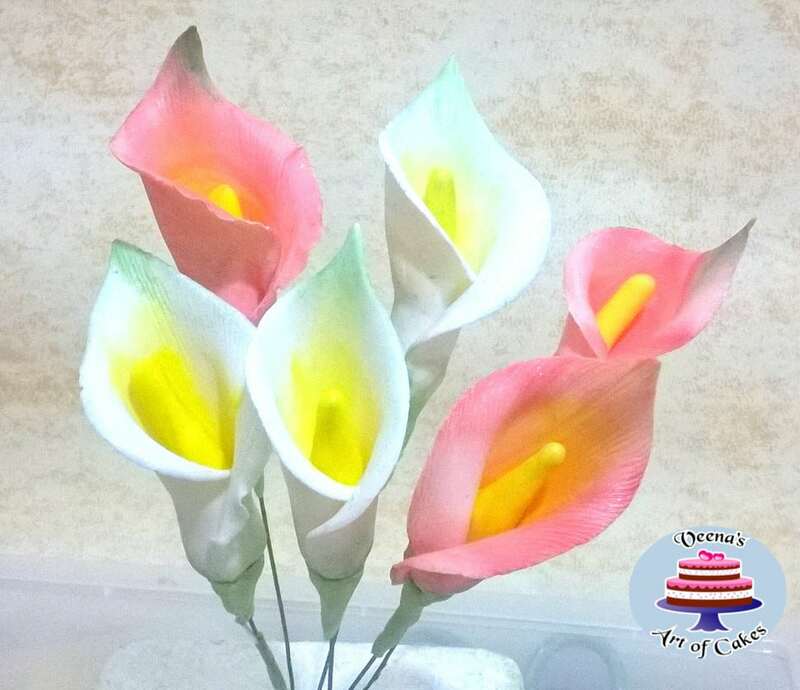 White Callas – If you are going to leave the calla lilies white.. just dust them lightly with a little pearl dust, this bring them to life. Other color Callas – Here I have colored the Rose pink ones with a light dusting of Rose pink, lavender and pearl. Once you have dusted the flowers you may choose to steam them. This sets the colors and gives them a lovely sheen too. I do hope you found this post useful. Here is my Tip Thursday for today that you can find on Facebook – share it or save it on your profile for future use. Thank you for this simple and easy tutorial – I am going to attempt this for the first time soon. Thank you, Celay. So happy you found this tutorial useful. Have a great day. Thank you for this tutorial. Thank you for all your tutorials. I’m learning so much. Thank you, Duane. So happy you find my tutorials useful. Thank you so much for this tutorial. Made my first sugar flower and turned out beautiful. Thank you so much Merrill. So happy to hear you found my tutorials helpful. Thanks for coming back to write this feedback. Have a wonderful day. Thank you, Swean. So happy you have success with this tutorial and loved it. Thanks for coming back to leave this feedback. Have a wonderful day. Thank you, Sonda. So happy you have success with this tutorial and loved it. Thanks for coming back to leave this feedback. Have a wonderful week. Thank you, Wilfred. So happy you have success with this Tutorial and loved it. Thanks for coming back to leave this feedback. Have a wonderful week.